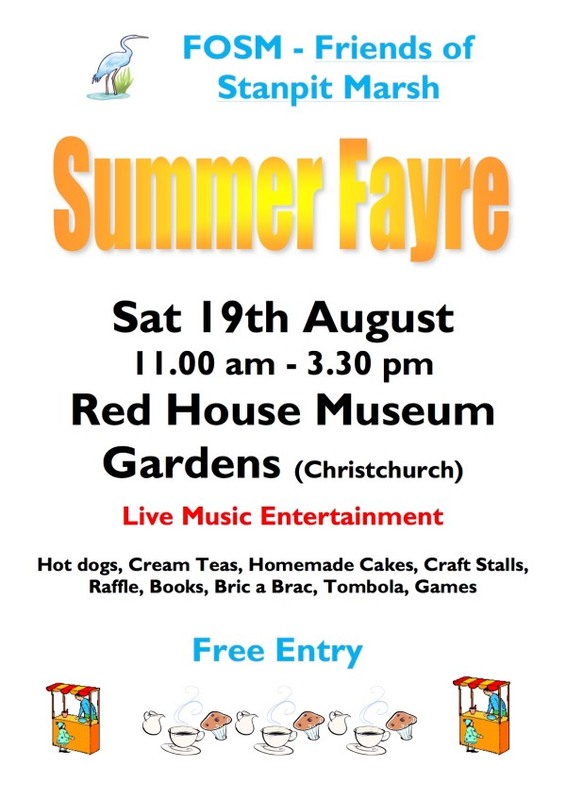 On Saturday 19th August, 2017 between 11am and 3.30pm at the Red House Museum Gardens, Christchurch, the Friends of Stanpit Marsh are holding another Summer Fayre. Admission is Free. On Saturday 20th August, 2016 between 12 noon and 4pm at the Priory House GARDENS, Christchurch, The Friends of Stanpit Marsh (FOSM) had planned to hold another of their Summer Fayres. Just a few days prior to the event, when all the work & preparations for stallholders, the band, cakes and the myriad other arrangements were fully 'on target', the emerging weather forecast for that weekend was frankly dire. Sadly, as our major fund-raising event was again due to use many gazeboes and other temporary structures; the unseasonable winds were now forecast to be destructive & consequently unsafe. So, after careful consideration, the committee chose to cancel all the arrangements for the event, in good time, in the interest of safety. There followed more work to warn disappointed participants and members of FOSM. Apologies to all those who turned up on the day and found the event cancelled. We look forward to 2017, good weather & a successful Summer Fayre. On Saturday 8th August, 2015 between 12 noon and 4pm at the Priory House GARDENS, Christchurch, The Friends of Stanpit Marsh (FOSM) held their Summer Fayre with Wildlife and Craft Stalls, Local History, Face Painting and Activities for Children and Adults, as well as Hot Dogs and Cream teas. There were Books, including Brand New books for just £1. Admission was FREE. There was also a Raffle. The bright sunshine was complemented by live music, provided by The Ragtime Revellers Band. Did you miss our Summer Fayre in 2015? Watch our slideshow, below.